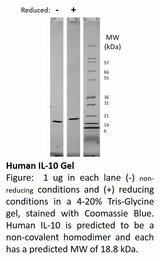 IL-10 Protein LS-G23659 is Recombinant Human IL-10 in E. coli It is biologically active and is low in endotoxin Less than 1.0 EU/µg protein (determined by LAL method)..
Interleukin 10 (IL-10) is an anti-inflammatory cytokine produced by macrophages and type 2 T helper (Th2) cells. 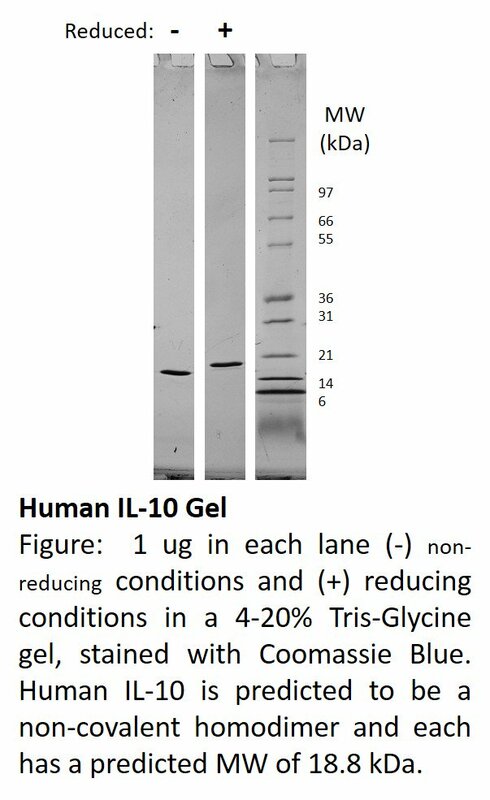 IL-10 inhibits the production of pro-inflammatory cytokines such as interferon gamma (IFNg), tumor necrosis factor alpha (TNFa), interleukin 2 (IL-2), interleukin 3 (IL-3), interleukin 4 (IL-4), and granulocyte-macrophage colony-stimulating factor (GM-CSF), made by macrophages and regulatory T cells. IL-10 also suppresses antigen presentation on antigen presenting cells, and enhances the survival, proliferation, and antibody production of B cells. Human IL-10 can act on murine cells, while murine IL-10 is not active on human cells. This product is produced with no animal or human origin raw products. All processing and handling employs animal free equipment and animal free protocols.